SSN D-Aspartic Acid regulates the natural production of testosterone to keep men strong and lean. Testosterone plays an important role in a male athlete’s life. Responsible for sexual desire, performance and keeping men physically strong. Low testosterone levels have also been shown to be a factor in mental illness such as depression. So keeping healthy levels is vital for an athlete’s fitness success. As men age their testosterone production decreases. Other factors such as stress, lifestyle, overtraining and environment may accelerate the decline. D-Aspartic Acid (DAA) is an amino acid which has been shown to regulate testosterone synthesis and may act on a stimulatory receptor (NMDA). An Italian study of healthy adult males showed an average of 42% increase in testosterone in as little as 12 days. Some participants experienced a boost of over 50% in the same period. The dosage used in the study was 3.12 grams per day. DAA has also been shown to act in the central brain region, stimulating the release of various hormones such as Growth Hormone (GH). The release of these hormones make it a perfect muscle building environment for weight lifting athletes. 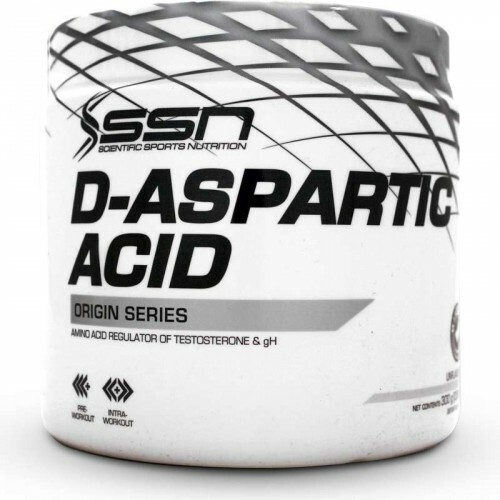 SSN D-Aspartic Acid contains pharmaceutical grade DAA, guaranteeing the quality of the product. Giving you 100 servings per tub, DAA is a cost effective solution for natural testosterone support. Nutrient reference values (NRVs) for individuals 4 years and older (2010). • One measured scoop (3g). • Take a serving approximately 20 – 30 minutes before your workout. • Alternatively take a serving during exercise. • A scoop can be added to a pre-workout or intra-workout supplement. Seek advice from your primary healthcare professional prior to use, especially if you have a known medical condition. Not suitable for pregnant or lactating females, or individuals under the age of 16 years. Individuals ages 16-18 should not exceed one recommended serving daily.